Property Size 1,716 sq. ft. This 3 bedroom, 3 bathroom condo has a prime location across of the Kolea Beach Club. While it offers the convenience and ease of access to a large 3 bedroom home, it is extremely special as you wont need to sacrifice enjoying a lovely ocean view! With the Kolea Beach Club so close, you can be at the pool or Anaehoomalu Bay within minutes by foot. Waikoloa Kings Shops and the Queens Marketplace are also within easy walking distance for dining, shopping and various local entertainment. 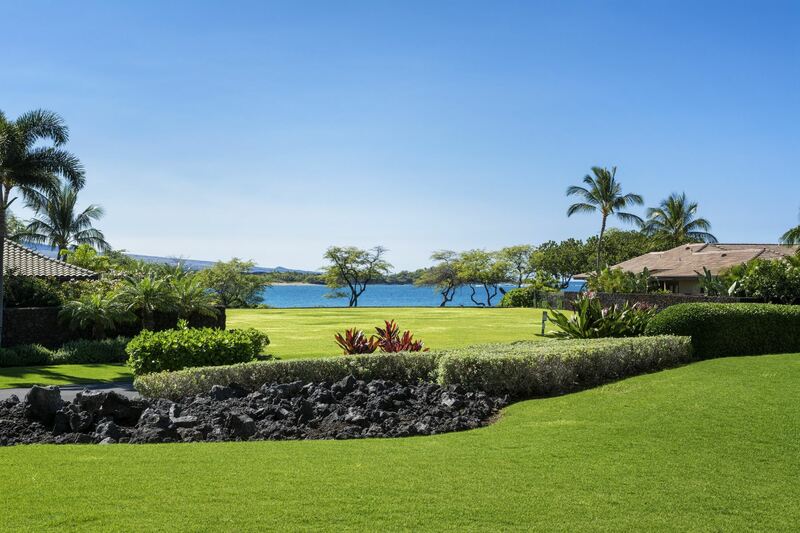 The Great Room opens up large mahogany pocket lanai doors to the impeccable landscaping and ocean view. The lanai has a built in Viking barbecue grill and mini refrigerator. The lanai is furnished with both an outdoor seating area as well as a table and chairs for outdoor dining. Each bedroom has it's own full bathroom. The master suite not only has ocean views, but has it's own private lanai door. The master bathroom leads to a spacious walk in closet. There are dual vanity sinks, a walk in shower and a deep soaking tub with a romantic window that can open up towards the king size bed in the master bedroom. As with the entire home, the African mahogany woodwork and classical travertine stone travel throughout to add elegance and distinction. There are two guest suites. The guest suite with the queen bed has a private bath with a travertine walk in shower. The third bedroom has two twin beds and a private entrance to the central bathroom with a tub/shower. All bedrooms have their own televisions. The fully stocked kitchen is enhanced with a pendant lights over granite island. Built in stainless steel appliances include a KitchenAid side by side refrigerator/freezer, microwave, stove top and oven. The dining table is situated closest to the glass lanai doors, and bar stools provide additional seating for a more casual dining atmosphere. The great room has a large television with a love seat and sofa. The lanai pocket doors can be nicely tucked into the wall to reveal an open and seamless transition to the tropical island breeze. The laundry room is equipped with a brand new full size washer, full size dryer and sink. Wireless internet, local phone service and central air conditioning are included at no extra cost.